hair snail, Trochulus hispidus from Switzerland. The leaf snails (Hygromiidae) are a very diverse family of terrestrial pulmonate snails (Stylommatophora), described by some (especially older) authors as a subfamily of the helicid snails (Helicidae). Leaf snails are small to medium sized snails, in general they are somewhat smaller than helicid snails. Many species living in the leaf litter or on trees are usually coloured in brownish tones, the xerophilous (dryness-loving) heath snails are predominantly white with dark bands. Likewise, shells of species living in humid places are thin-walled and often grown with hair, the xerophilous species are thick-walled and hairless. A love dart is found in many species, but by no means all of them. It is assumed, that in Europe about 50 species are present. 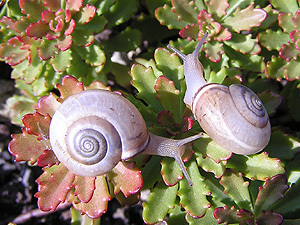 The family altogether on the other hand is distributed over the Palaearctic: From the Azores and the Canary Islands over Europe and North Africa as far east as Central Asia, leaf snails can be found. Systematically in the matter of leaf snails, many things remain unclear. Especially about the classification of partial groups as subfamilies or so-called tribus (between subfamily and genus) there is not always consent. According to most systematic sources (Mollbase, Fauna Europaea etc.) the Hygromiidae family contains five subfamilies: Hygromiinae, Ciliellinae, Geomitrinae, Monachinae and Ponentininae. According to Steinke et al. (2004) the Helicellinae are also to be seen as a subfamily, but none of the other systematic sources concur. Instead there they are always described as subgroups (Tribus Helicellini and separate genera 'incertae sedis') of the Hygromiinae. incertae sedis - Xerolenta etc. Genera and Tribus only are mentioned, as long as they are described on the present pages. Complete list on: Fauna Europaea: Hygromiidae Tryon 1866. Explanation of shell characters as means of identification. Description: The Cartusian snail has got a milky grey white to yellowish white shell, whose bulbous whorls are coiled to a flat cone. 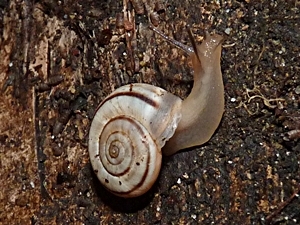 Near the aperture, the shell may be of reddish or brown colour. 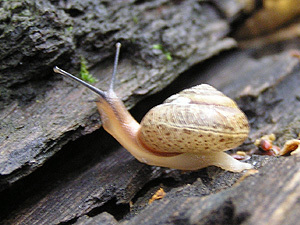 Translucent brown bands can be visible, becoming paler towards the shell mouth. The umbilicus is very narrow and partially covered by the shell mouth lip. Site: W: 9 - 15 mm; H: 6 - 10 mm; N: 5½ - 6½. (Abbreviations). 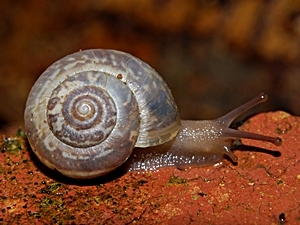 Habitat and Distribution: The Cartusian snail lives in sunny and dry bushes and grassy slopes, hedges and street sides in lower altitudes, above 500 m (1500 feet) above sea level it becomes rare. The area of distribution covers the complete European part of the Mediterranean and the Black Sea region, in the west from France to South-eastern England and the Southern Netherlands, in Germany in the Rhine Valley, in the East until Hungary, dispersedly into Slovakia and Eastern Austria. The species has often been introduced and so frequently occurs in isolated places. Gallery: Cartusian snail (Monacha cartusiana). Among other snail species, Monacha cartusiana may serve as an intermediate host to Dicrocoelium lanceolatum, the lesser liver fluke. Table: Monacha cantiana and Monacha cartusiana in comparison. Description: The Kentish snail has a creamy white to brownish red shell, which in juvenile specimens can be grown with hair on its upper side. The whorls are slightly convex and the spire can be flattened or almost conical. The aperture displays a whitish to reddish lip, which, however, is less distinct than in Monacha cartusiana. 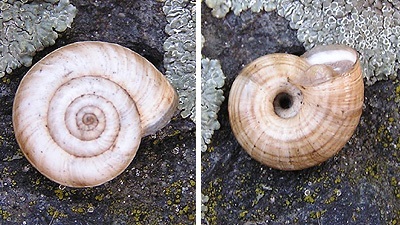 The shell navel (umbilicus) is slightly wider than in Monacha cartusiana (picture on the right), taking about an eleventh to a seventh of the shell diameter. 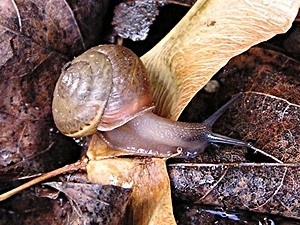 The snail itself is lightly coloured, the body's front is reddish with greyish brown tentacles. The snail crawls slowly, is easily irritated and the secretes a colourless mucus. Dimensions: W: 16 - 20; H: 11 - 14 mm; N: 5 - 6. (Abbreviations). 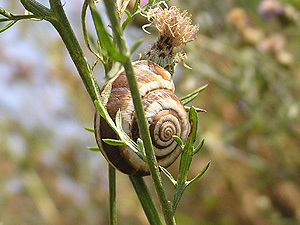 Habitat and Distribution: The Kentish snail lives in the herb layer of hedges, in wasteland and in shrubs. It is also found near the roadside and alongside railway tracks. It even appears in sand hill habitats, but it is not found in forests. Monacha cantiana prefers well drained calcareous ground. Especially the juveniles spend long periods of time aestivating on plants in some height. Originally the Kentish snail came from Italy and southern France. From there it was introduced to northern France, Belgium, the Netherlands and North Germany, as well as in the east of Austria near Vienna. The latest appearance of Monacha cantiana as an introduced species (neozoon) was in the Czech Republic. Freshly settled populations often appear in recently planted vegetation at roadsides and near railway tracks, where they had been introduced with those plants. Also, like the maritime garden snail (Cernuella virgata, see below), Monacha cantiana is found in closed-down railway areas recently overgrown with ruderal vegetation. To Great Britain, from where the species was first described in 1803, it was introduced in late Roman times by farmers and has been spreading since, especially during the Middle Ages, so today there is a largely consistent area of distribution in the south and east of England. Besides, the species is found in isolated populations in Wales, western Central England, North England (Yorkshire) and Scotland. The Kentish snail was not able to settle in Ireland. Threat Situation: In Lower Saxony, and at times in all of Germany, the Kentish snail, or Larger Cartusian snail, as it is called here, is classified as critically endangered, as it appears only in a disperse and discontinuous manner (see also: IUCN Threat Categories). Francisco Welter-Schultes: Monacha cantiana species homepage. Fischer, W. (1998): Beiträge zur Kenntnis der Molluskenfauna Österreichs V. Zum Vorkommen von Monacha cantiana (Montagu 1803) in Wien und Niederösterreich. - Nachr.bl. erste Vorarlberger malak. Ges. 6: 29 - 30. Fischer, W., Duda, M. (2004): Beiträge zur Kenntnis der Molluskenfauna Österreichs VII. Cernuella virgata (Da Costa 1778), neu für die Molluskenfauna Wiens, sowie Bemerkungen zur Ausbreitung von Monacha cantiana (Montagu 1803), Cernuella neglecta (Draparnaud 1805), Hygromia cinctella (Draparnaud 1801) und Cornu aspersum (O. F. Müller 1774) in Niederösterreich und Wien (Mollusca: Gastropoda) - Nachr.bl. erste Vorarlberger malak. Ges. 12: 10 - 14 (PDF). Hlaváč, J. Č.; Peltanová, A. (2010): First occurrence of the Kentish Snail Monacha cantiana (Mollusca: Gastropoda: Hygromiidae) in the Czech Republic - Malacologica Bohemoslovaca 9: 11 – 15 (PDF). Wiese, V. (2009): Korrektur: Noch kein Nachweis von Monacha cantiana (Montagu 1803) in Thüringen (Gastropoda: Stylommatophora: Hygromiidae). - Mitt. dtsch. malakozool. Ges. 81 31 – 32 (PDF). Description: The incarnate snail's name comes from the reddish shell area ear the shell mouth. The remainder of the shell usually is less reddish, but more yellowish horn coloured to reddish brown. The shell surface is nearly smooth with a fine pattern of scales. The shell coiled to a low conical shape gives the shell an overall flat globular form. In grown-up specimens the apertural lip is distinct and swollen at the lower rim. The umbilicus is narrow, but open and only occasionally covered by the apertural lip. Dimensions: W: 13 - 16 mm; H: 9 - 11 mm. (Abbreviations). 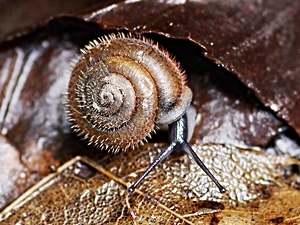 Habitat and Distribution: The incarnate snail is a ground snail living in the leaf cover of moderately humid forests, under bushes and in rock rubble. Only juveniles crawl up low plant stems. The distribution area of the Central European snail goes until Central France in the West, in the South from the Southern Alps to Bulgaria, in the East until the Western Carpathians. In the North German Plain the species occurs up to the River Oder, in the North until Southern Sweden. Gallery: Incarnate snail (Monachoides incarnatus). Eastern heath snail (Xerolenta obvia). Description: The Eastern or white heath snail's shell (Xerolenta obvia) is white, with a finely striped or ribbed surface. The bands are dark brown to black and often dissolved into spots. The apertural rim of the slightly oblique and rounded shell mouth is straight and sharp. The umbilicus takes about a quarter of the shell's overall diameter, in the terminal whorl its diameter grows. Dimensions: W: 14 - 20 mm; H: 7 - 10 mm; N: 5 - 6. (Abbreviations). 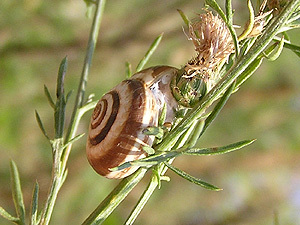 Habitat and Distribution: The Eastern heath snail lives in steppes and on dry grass slopes. Large numbers of individuals may be found aestivating in the vegetation. The area of distribution of Xerolenta obvia stretches from Asia Minor over the Eastern and Central Balkan peninsula and the Carpathian countries up to the Baltic Sea's Southern Coast and to Southern France. The Western border of the distribution area in Germany runs from Heidelberg to Lübeck. Differences: Xerolenta obvia is different from the following species in having a narrower umbilicus and a wider apertural whorl not descending distinctively to the aperture. Western heath snail (Helicella itala) from Switzerland. 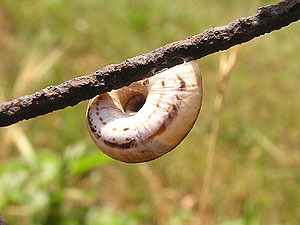 Description: The western heath snail's (Helicella itala) shell is yellowish in colour, with pale brown bands, that are not as sharp as in the former species. The spire is flatly conical, the aperture oblique and laterally oval. On the side and on the bottom the apertural rim is broadened. The shell's umbilicus is perspective and widens to one third of the shell's diameter. It is wider than in the former species. Dimensions: W: 9 - 25 mm; H: 5 - 12 mm; N: 5½ - 6½. (Abbreviations). Habitat and Distribution: Contrary to the eastern heath snail, the western species needs more humidity. Its area of distribution covers most of western Europe, in the North it extends until southern Scandinavia, in the East until central Germany and western Lower Austria. Differences: The maritime garden snail is more distinctly bulbous in shape than the common domestic heath snail species. Helicella itala may however be confounded with Cernuella neglecta, also present in Germany. But Helicella itala has got a wider umbilicus, a flatter surface and a less rounded aperture. 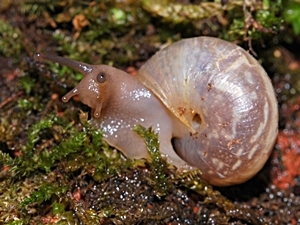 Among other snail species, heath snail species, such as Helicella itala, may serve as an intermediate host to Dicrocoelium lanceolatum, the lesser liver fluke. Maritime garden snail (Cernuella virgata). Description: The maritime garden snail is more globular than the previously described species. The shell spire is high and slightly curved, its surface irregularly ribbed. The shell mouth is circular, the umbilicus narrow, often covered by the apertural lip. 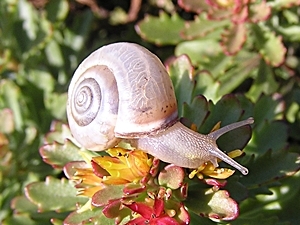 Colour and form of the snail are very variable. The shell may be whitish or reddish yellow, usually with dark brown bands, that may be discontinuous or dissolved into spots. Dimensions: W: 8 - 25 mm; H: 6 - 19 mm; N: 5 - 7. (Abbreviations). Habitat and Distribution: The maritime garden snail's habitat are dry biotopes, such as dune areas near the coast. The distribution area covers the Mediterranean without the Levantine coasts, also the Atlantic coasts up to the Netherlands, including the British Isles. However, the specimens displayed come from a place in Breitenlee near Vienna, where they were introduced on a derelict railway area. 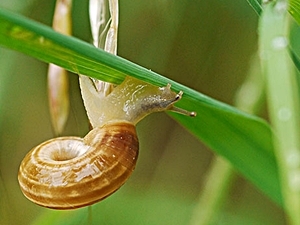 In Germany the maritime garden snail has also been introduced on industrial fallow land in the Ruhr area. Fischer, W., Duda, M. (2004): Beiträge zur Kenntnis der Molluskenfauna Österreichs VII. - Nachr.bl. erste Vorarlberger malak. Ges. 12: 10 - 14 (PDF). (See above). Continued: Leaf Snails (Hygromiidae) Part 2: Hair snails and leaf snails. Wildlife Trust for Bedfordshire, Cambridgeshire, Northamptonshire and Peterborough.